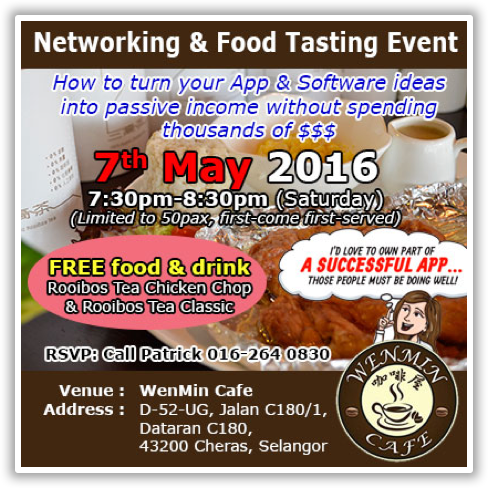 There will be a networking and fully sponsored food tasting event on 7th May, Saturday 7:30pm, at WenMin Cafe. Closing date for registration is 4th May Wednesday 11:59pm. Participants are required to attend a short presentation and to taste the hosting cafe's signature dish and beverage, which are made with unique ingredients from Taiwan. This is a one-hour closed event and it is limited to 50 pax. Entrepreneurs, college/university students or graduates, and young working adults are encouraged to attend. You may come as a group. Interested participants please SMS, call or Whatsapp to register your seats. Health benefits of rooibos tea include its use as a cure for nagging headaches, insomnia, asthma, eczema, bone weakness, hypertension, allergies, and premature aging. The tea is absolutely free from caffeine content and is also low in tannins. Drinking rooibos tea can further ease severe stomach cramps, as well as bring relief to asthma and other related conditions. It also boosts the immune system of the human body. Global Leader in Developing Technology Solutions, helps everyday people around the world to discover ideas that can turn into lucrative software, websites, mobile apps, and games. Anyone, regardless of their background, education, or experience can become an Idea Partner and participate in this exciting world.